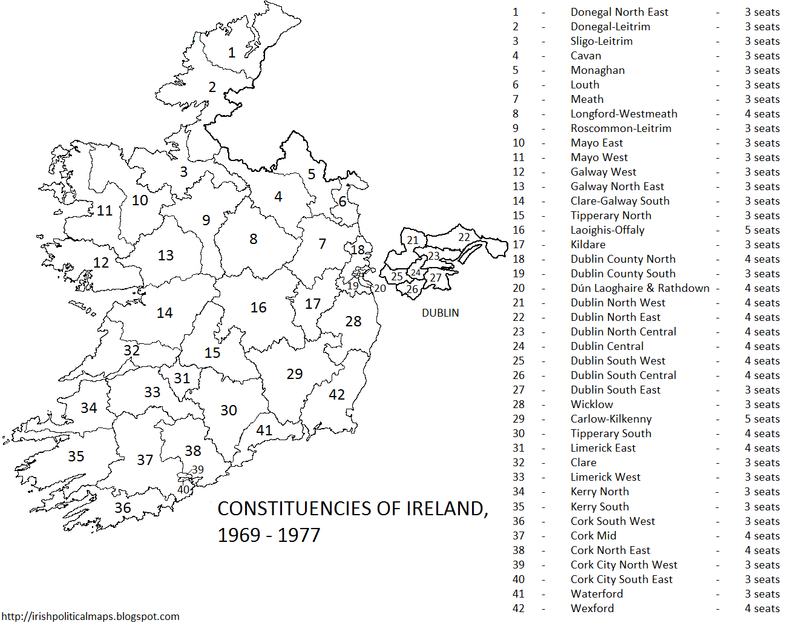 1969 saw yet another revision of constituencies, the second of four such revisions over a 20 year period. The Electoral (Amendment) Act of this year was, as constituency revisions often were at this time, an effort to maximise the vote for the party in government. Radical changes were made compared to previous revisions, particularly in the areas of Leitrim, Meath, Cork, Clare and particularly Dublin, which found itself split into 10 different constituencies, with 38 seats out of an unchanged national total of 144 - just over a quarter of the Dáil. Another noticable change brought by these revisions is the increase in the number of three-seater constituencies. 26 out of the 42 constituencies, or 61.9% of constituencies overall, held three seats each. This was a far cry from the seven and eight-seater constituencies of forty years ago, and appeared to be biased towards urban areas. Cork City in particular benefitted from this - the borough constituency was divided in two, meaning that the city alone now returned 6 TDs. By contrast, predominantly rural constituencies such as Laoighis-Offaly and Carlow-Kilkenny remained as two-county constituencies as well as five-seaters. The county of Leitrim disappeared off the map entirely, swallowed up by the neighbouring counties of Donegal, Sligo and Roscommon. Meanwhile, the majority of the Dublin constituencies returned 4 TDs, accounting for the increasing number of Dublin TDs. 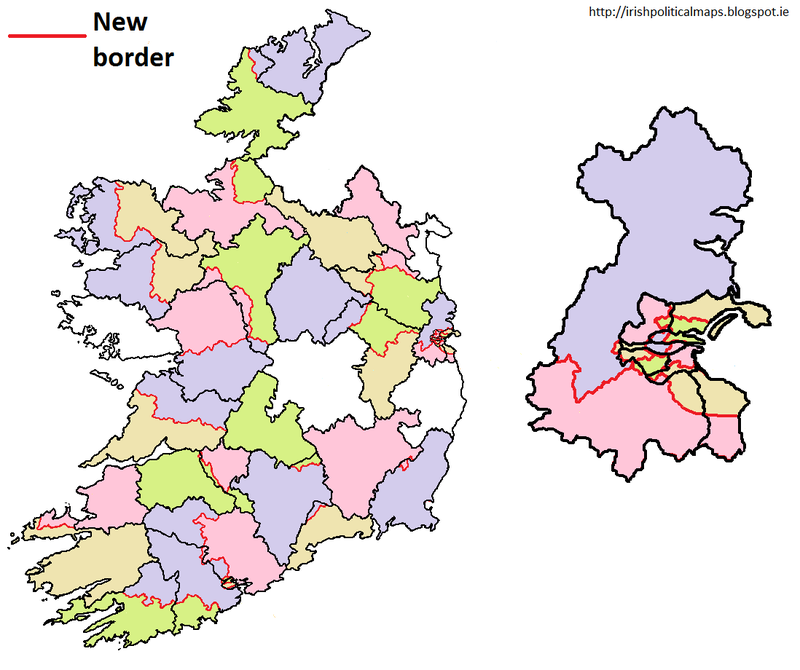 These boundaries would serve two elections - 1969 and 1973 - before another government would attempt another, rather infamous revision for its own benefit.